Begonya Pozo was born in Valencia in 1974. Her first degree was in Hispanic and Italian Philology at the University of Valencia, where she obtained her doctorate on the Valencian poet César Simon. Since 1998 she has taught in the Italian Department at the same University. She is also Director of the Aula de Poesía there, which she co-founded with the poet Vicent Alonso in 2002. Begonya Pozo writes in both Spanish (Castilian) and in Catalan (Valencian). To date she has published two books of poems in Castilian, El muro de la noche, 2000 [The Wall of Night] and Tiempo de sal, 2004 [Time of Salt]. Many of her poems in Valencian have appeared in anthologies, magazines and on the web, as well as in Castilian translation by Carlos Jiménez Arribas and Antonio Méndez Rubio. 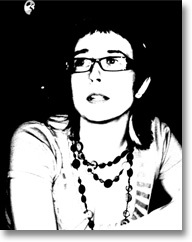 Since 2004, she has also directed the Valencian-language poetry workshop at the Polytechnic Univesity of Valencia (UPV). Her latest project is organising cultural events in association with the Micalet Choral Society, which will combine contemporary poetry, music and painting.